The word carnivore often conjures up images of large, dangerous predators such as lions and tigers. Few, however, realize that they spend most of their lives in the presence of the world's most common carnivore--the domestic dog. Man's so-called best friend is indeed the most numerous and widespread of the world's carnivores. It has followed in the footsteps of humans colonizing every continent on Earth and even outer space. Remember Laika, the dog who created history as the first earthling to go into space? In much of the developed world, dogs are generally confined to certain areas, but in most developing countries these animals roam freely, without any restriction. While free-ranging dogs--often referred to as strays--in urban areas receive a lot of attention and publicity, it is in the vast rural areas that they might cause more severe problems.This is because much wildlife exists in rural areas throughout the world. And, in India and other countries wildlife reserves are surrounded by human habitation. In such areas free-ranging dogs have numerous opportunities to interact with wildlife at multiple levels--as predators, prey, competitors, and disease reservoirs or vectors. The ecology of free-ranging domestic dogs has, however, rarely been studied. Only a handful of studies--mostly in Africa and North America--have even attempted to answer a very basic question what do free-ranging domestic dogs eat? These studies have shown that dogs kill and eat wildlife--but apart from that we know little else. We also know that no dog population is completely dependent on wildlife. Now this might seem to be a good thing, but it is in fact the opposite. Most dog populations are highly dependent on human-provided food, in other words, they are subsidized by humans. The World Health Organization estimates that India alone is home to 25-30 million domestic dogs. When such high numbers of dogs include even a small amount of wildlife in their diet, collectively they can have a serious impact. For example if a domestic dog were to eat just one egg or chick of an Indian bustard in the Great Indian Bustard Sanctuary in Maharashtra, it can have serious impact on the breeding success of this critically endangered bird. Dogs harbour several diseases that can be deadly not only to humans (such as rabies) but to wild carnivore species as well. Dogs also transmit diseases such as canine distemper virus (cdv) and canine parvovirus (cpv). A large number of African lions in the Serengeti National Park were wiped out by a cdv outbreak transmitted by domestic dogs. Endangered species such as the African wild dog and the Ethiopian wolf have suffered significant population losses because of diseases contracted from domestic dogs. 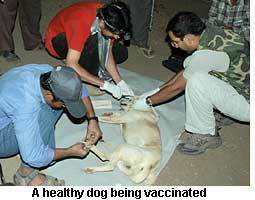 In India, we have very little information on the diseases affecting domestic dogs and wildlife. Imagine what would happen if a cdv outbreak started killing tigers in Kanha or Ranthambhore? Worse still, we would not link the symptom to its cause even if it was happening already. A recently concluded study of the Great Indian Bustard Sanctuary, Nannaj, Maharashtra by a team of scientists (including Aniruddha Belsare from Pune, Matthew Gompper from the University of Missouri and I) illustrates the huge problem we have on our hands. From 2005 to 2007 we studied how domestic dogs compete with a little known but common canid, the Indian fox. Using portable diagnostic assay kits we tested 80 dogs from three villages around the wildlife sanctuary for exposure to two main viruses cdv and cpv. The results were astounding, but not unexpected. More than 95 per cent had very high levels of exposure to both cdv and cpv. Since both these diseases affect dogs at an early stage of their lives, this meant that they had survived the first exposure, and were now immune to the disease. Significantly, since the disease keeps circulating in the population, they were now carriers. We also found that none of the sampled dogs died from any of the diseases even one month after initial observations. Similar tests on the most common canid in the study area, the Indian fox, revealed that that 34 per cent were positive for recent exposure to cdv and 36 per cent for cpv. Of these, one sample had been taken from a freshly dead fox that had shown acute and severe symptoms of disease. Because the sampled animals were radio-collared, we were able to track them regularly and follow their fate. We discovered that three other animals that tested positive for cdv died within a month, indicating high mortality due to the disease. On being presented with our initial findings the Maharashtra forest department, and the chief wildlife warden of the state organized a meeting with the state Animal Husbandry Department to discuss the potential for vaccination and population control of dogs surrounding the Protected Area. We recommended that dogs owned by farmers and villagers be given preference, and that the number of dogs to be vaccinated free of charge per household be limited to two and that these vaccinations be done over a period of 2-3 months. The Maharashtra Forest Department took this matter seriously, and organized vaccination camps in villages surrounding the Great Indian Bustard Sanctuary. However, as we pointed out in our recommendations, vaccination alone is not a solution. This is because of the incredibly high population density of dogs here--as much as 134 dogs per sq.km. If vaccinated dogs live longer and beget more this may ultimately result in a larger dog population. Some measures should also be taken to reduce the population. 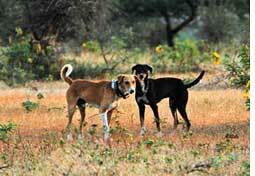 A large proportion of dogs are strays, they are essentially free-loaders on the wildlife. While earlier, these animals were considered benign, we now know that they are a significant threat to both human and animal health. There was so much furore recently over the possible outbreak of bird flu, and crores of rupees were spent and lost in fighting this "problem", one in which not a single human death was reported from India, and even the worldwide toll is under a thousand. Compare this to rabies, which is spread primarily by domestic dogs in India and which takes a heavy toll of a reported 30,000 people yearly. Yet only a meagre amount is spent in tackling the problem. The Animal Welfare Board of India has reportedly spent Rs 22.5 crore on animal birth control programmes over the last decade which is the only legal method of controlling dog populations in the country. These have not worked effectively anywhere in the world, and are not working in India either. The problem is not that sterilization programmes don't work per se, but that they have to be conducted in a sustained manner and on a large scale to have significant impact. One can also say that by vaccinating dogs, one is in fact removing an important measure of natural population control disease. This in turn results in increased population of dogs and increased disease reservoir. Knowing the costs to both humans and wildlife, is it advisable to let well-meaning but misdirected animal rights activists--most of them city dwellers--determine the fate of our precious and endangered wildlife? The need of the hour is to have a sustained and scientifically based domestic dog control programme. Not just because wild animals are threatened, but because man's best friend also poses a real and serious threat to human life.